Republican Party of Texas - The Republican Party of Texas is pleased to announce the launch of Texas GOP Jobs, the official statewide Republican job network for Texas. It was developed to connect those who desire to work in Texas politics with employers who are looking for the right staff. This new online hub is the first sanctioned Republican employment website in RPT history. For those seeking employment or internships in Republican political jobs, the site allows users to create a profile with their resume and the ability to peruse the listing of jobs that match their interests. Likewise, employers can create an account and post job opportunities for various positions and search the directory for potential staff. Employment positions on the website include: campaign jobs, state or federal agencies, political committees, consulting services, lobby firms and more. Texas GOP Jobs was developed by RPT Political Director Travis Griffin and web developer Chris Leonard. For those interested, please visit http://jobs.texasgop.org to learn more and create an account today. 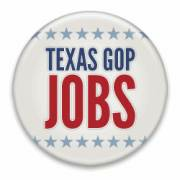 You can also follow @TexasGOPJobs on Twitter for updates.